The Fitch Bandwagon enjoyed multiple incarnations during its long NBC run, beginning in the 1930s as a showcase for popular dance orchestras. Sponsored by the F.W. Fitch Company, an Iowa-based manufacturer of hair care products, the series hosted the top bands of the day. It also included commentary by such masters of ceremonies as "Old Stager" Henry M. Neely, Garry Moore, and announcer Tobe Reed. 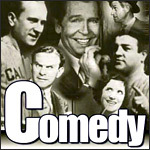 The program would shift toward a musical variety format in the mid-1940s, featuring comedienne Cass Daley. The Bandwagon's last iteration is its most famous, with Fitch turning the program over to Phil Harris and Alice Faye for its final two seasons. As with their later Rexall show, the Harrises portrayed Fitch as a good-sport figure of fun during their tenure with the company, presenting F. W. himself as a man utterly bewildered by the antics of his star comedian.